While working on event receiver I found that my ItemAdding and ItemAdded receivers firing twice. 2- In Feature.template.xml set Scope="Web"
And its done. Now it is working fine. 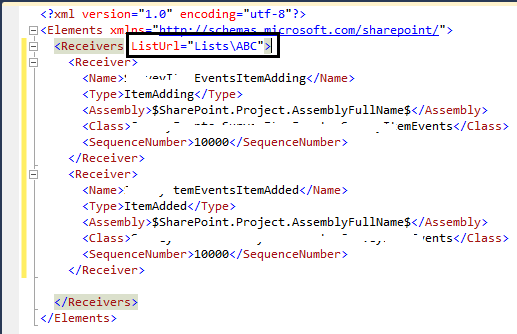 Same issue happens when you try to set ListUrl instead of ListTemplate type in Event Receiver's Element.xml file. This issue is also fixed with the above solution. Basically, ListUrl property does not work for Site Collection scope (Site Scope) but only with Web Scope (Site Level). Hello Sir i can't change my scope to Web because of some other requirement, so please what should i tell to get overcome of this problem. I can't change feature scope to web scope, please tell any other solution.